Enjoy a Pulitzer Prize Winner! Home > Blog > Display > Enjoy a Pulitzer Prize Winner! 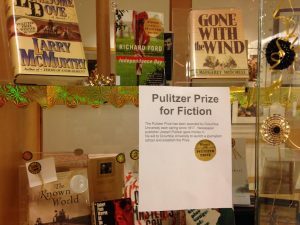 The Pulitzer Prize for Fiction is one of seven American Pulitzer Prizes awarded annually. It recognizes distinguished fiction by an American author published during the preceding calendar year. This year marks the 100th year awarding the Pulitzer Prizes! May the 4th be with you, Dana!